in Koparde, Mehta, Reddy, et al., 2018. Fig 1. 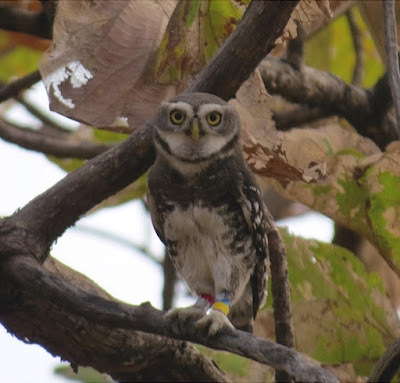 Co-distributed Indian owlets show plumage similarity, however can be identified based on size and markings on the chest and forehead. Presence of white spots and brown bars in case of Athene brama and Glaucidium radiatum respectively are identification keys. A. brama and G. radiatum by Pankaj Koparde. Distribution of few Palearctic and Oriental owlets as per Birdlife International (2015). H. blewitti is the only range-restricted, rare owlet among Indian owlets. in Hareesh & Sabu, 2018. Amomum riwatchii, a new species of Zingiberaceae from northeastern India is described and illustrated. It is similar to A. carnosum, but differs from the latter in having non-stoloniferous rhizome, oblong lanceolate lamina, 5−6 mm long ligule with entire apex, broadly ovate or orbicular dark red thick outer bract, calyx lobes with cuspidate or horned apex, oblong labellum with entire apex and non-winged capsule. The swimming capacities of pelagic larvae affects gene flow and range size in demersal marine fishes. Dispersal is a fundamental process governing the ecological and evolutionary dynamics of any given species. 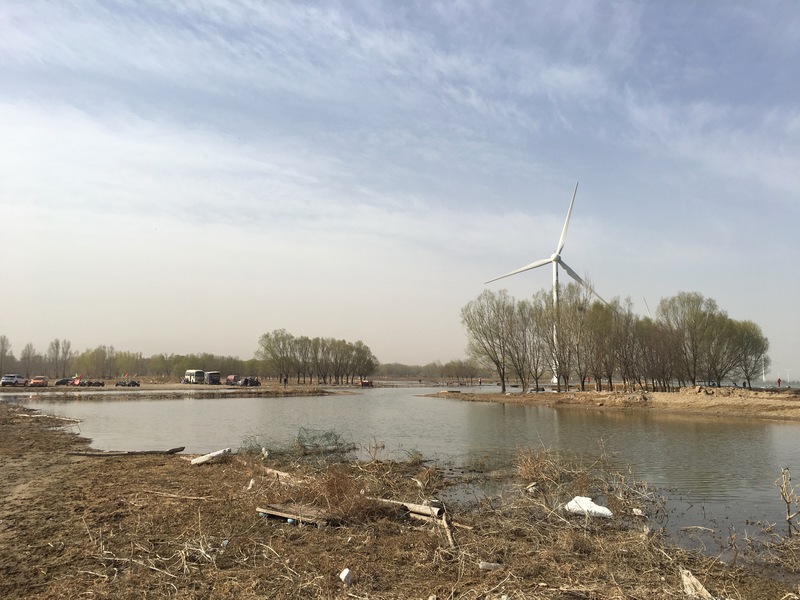 Due to inherent challenges associated with measuring dispersal directly, identifying proxies for dispersal capacity has long been an active field of research across ecosystems. In marine systems, pelagic larval duration (PLD) has been one of the most widely used indicators of interspecific dispersal potential. 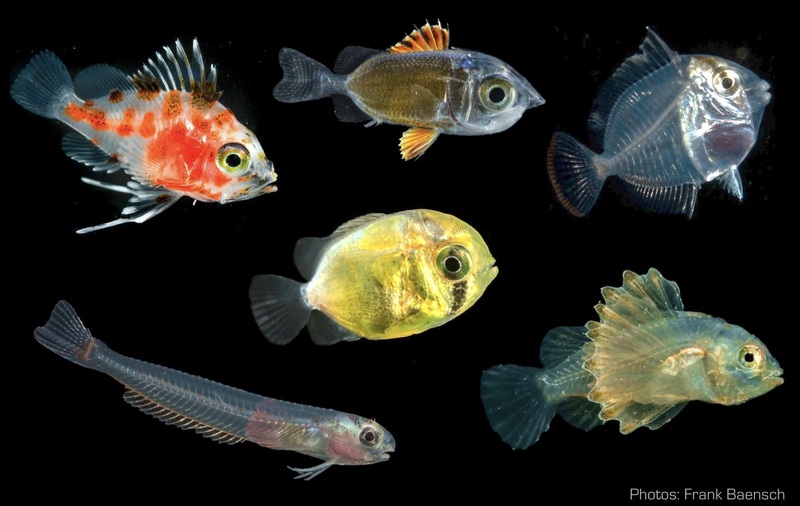 The validity of this proxy, however, relies mostly on the assumption of entirely passive dispersal, a notion that has been challenged by findings of strong larval behavioural capabilities. Here, we assessed the effect of larval swimming capacities measured as mean critical swimming speed (U-crit) on emergent species-level properties related to dispersal potential, population genetic structure and global range size, in demersal marine fishes. In a meta-analytic framework, we tested the relative importance of U-crit versus other intrinsic (PLD, egg type, adult body size) and extrinsic (genetic marker type, study scale) predictors of isolation-by-distance slope, global FST and range size. U-crit showed stronger relationships with all emergent response variables than PLD and was consistently the most important predictor in multi-model inference. Our findings indicate that larval swimming capacities could serve as a powerful indicator of a species’ long-distance dispersal potential. 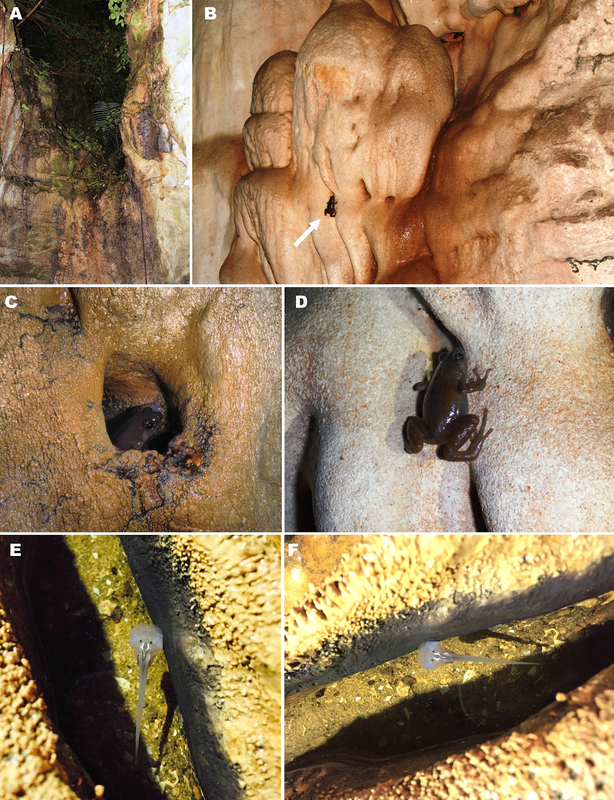 We report on a discovery of Siamophryne troglodytes Gen. et sp. nov., a new troglophilous genus and species of microhylid frog from a limestone cave in the tropical forests of western Thailand. To assess its phylogenetic relationships we studied the 12S rRNA–16S rRNA mtDNA fragment with final alignment comprising up to 2,591 bp for 56 microhylid species. Morphological characterization of the new genus is based on examination of external morphology and analysis of osteological characteristics using microCT-scanning. Phylogenetic analyses place the new genus into the mainly Australasian subfamily Asterophryinae as a sister taxon to the genus Gastrophrynoides, the only member of the subfamily known from Sundaland. 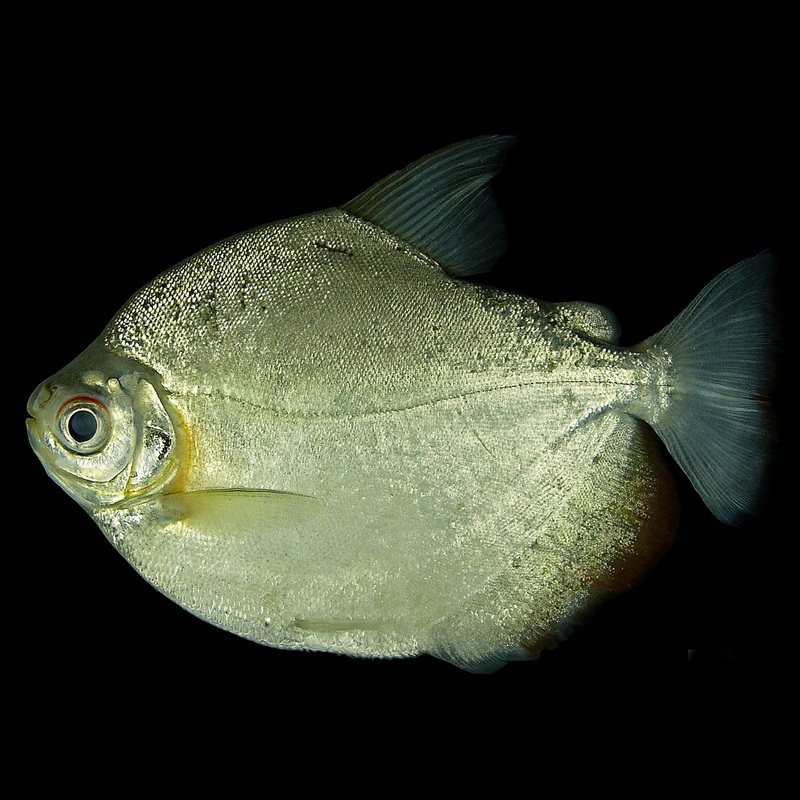 The new genus markedly differs from all other Asterophryinae members by a number of diagnostic morphological characters and demonstrates significant mtDNA sequence divergence. 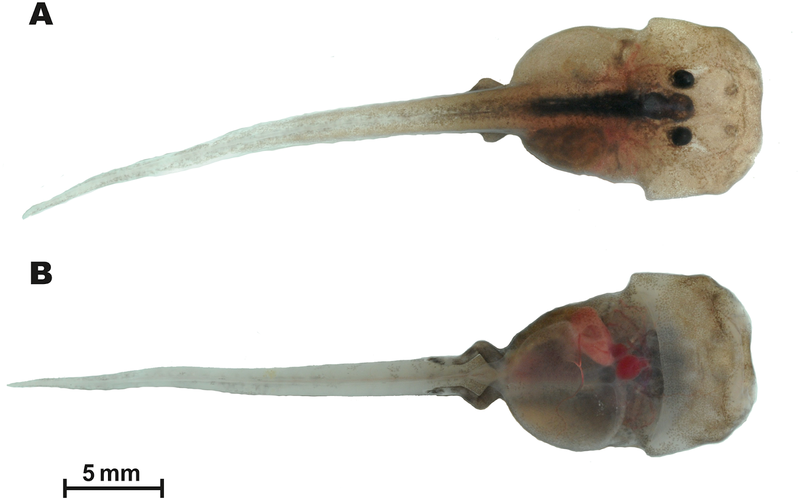 We provide a preliminary description of a tadpole of the new genus. Thus, it represents the only asterophryine taxon with documented free-living larval stage and troglophilous life style. Our work demonstrates that S. troglodytes Gen. et sp. nov. represents an old lineage of the initial radiation of Asterophryinae which took place in the mainland Southeast Asia. Our results strongly support the “out of Indo-Eurasia” biogeographic scenario for this group of frogs. To date, the new frog is only known from a single limestone cave system in Sai Yok District of Kanchanaburi Province of Thailand; its habitat is affected by illegal bat guano mining and other human activities. As such, S. troglodytes Gen. et sp. nov. is likely to be at high risk of habitat loss. Considering high ecological specialization and a small known range of the new taxon, we propose a IUCN Red List status of endangered for it. 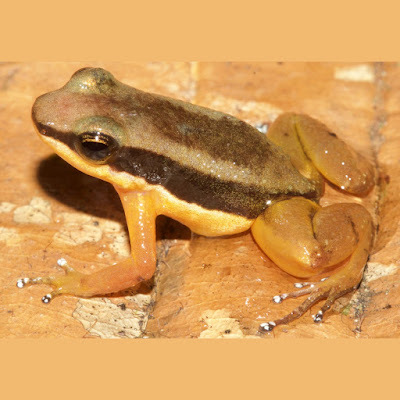 Figure 5: Male paratype of Siamophryne troglodytes Gen. et sp. nov. (ZMMU A-5818) in life in dorsolateral aspect. Photo by N. A. Poyarkov. Diagnosis: A medium-sized (19 mm < SVL < 30 mm) member of the Australasian subfamily Asterophryinae (family Microhylidae), with the following combination of morphological attributes: (1) both maxillae and dentaries eleutherognathine, no maxillary teeth; (2) vertebral column procoelous with eight presacral vertebrae (PSV) lacking neural crests; (3) no sagittal crest on cranium; (4) frontoparietals conjoined, connected by long suture; (5) nasals wide, calcified, but not contacting each other medially; (6) vomeropalatines small, not expanded, vomerine spikes absent; (7) cultriform process of parasphenoid comparatively narrow; (8) clavicles present as slender tiny bones, lying on the procoracoid cartilage not reaching scapula or the midline; (9) omosternum absent; (10) sternum large, anterior portion consists of calcified cartilage, xiphisternum cartilaginous; (11) weak dorsal crest present on urostyle, absent on ilium; (12) terminal phalanges large T-shaped; (13) all fingers and toe discs with terminal grooves; (14) subarticular tubercles weak, discernible only at digit basis; (15) toe webbing absent; (16) tympanum distinct; (17) two transverse smooth palatal folds; (18) pupil round; (19) snout rounded, equal to EL; (20) development with a larval stage, tadpole with peculiar dorso-ventrally compressed morphology. Type species. 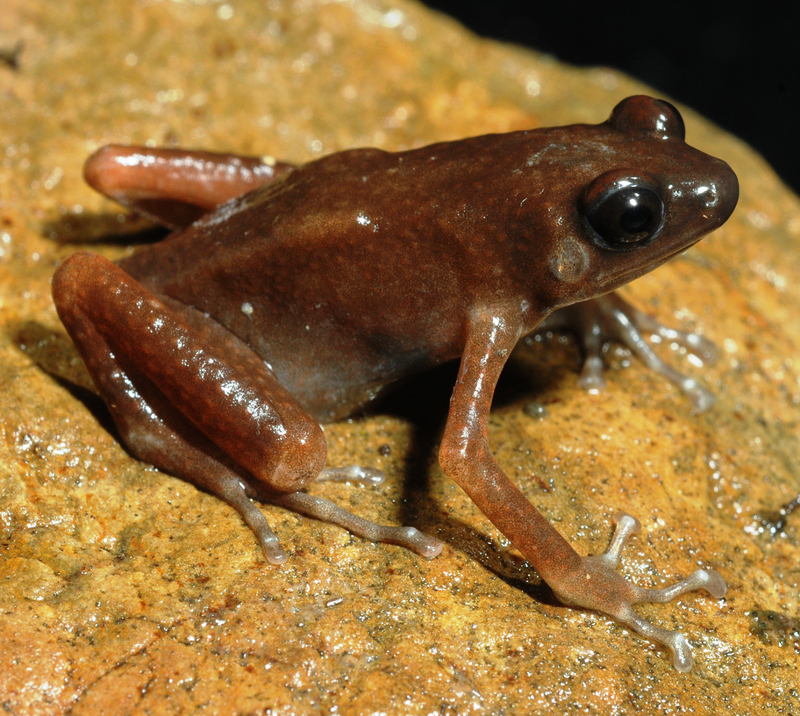 Siamophryne troglodytes sp. nov.
Other included species. 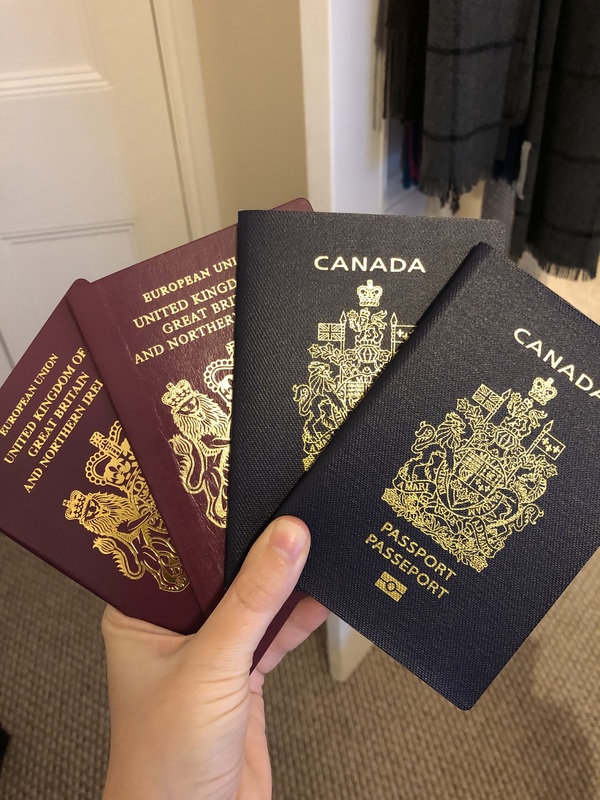 None are known at present. Distribution: To date, S. troglodytes sp. nov. is only known from a small cave system in a karst region of Sai Yok District, Kanchanaburi Province, northern Tenasserim Region, western Thailand (see below the description of the species) (see Fig. 1). Etymology: The generic nomen Siamophryne is derived from “Siam”—the old name of present-day Thailand; referring to the range of the new genus, which to date is only known from western Thailand; and the Greek noun “phryne” (φρÚνη; feminine gender), meaning “toad” in English; this root is often used in the generic names in Asterophryinae microhylid frogs. Gender of the new genus is feminine. Figure 10: Breeding habitat of Siamophryne troglodytes Gen. et sp. nov. at the type locality—Sai Yok District, Kanchanaburi Province, northern Tenasserim Region, western Thailand. 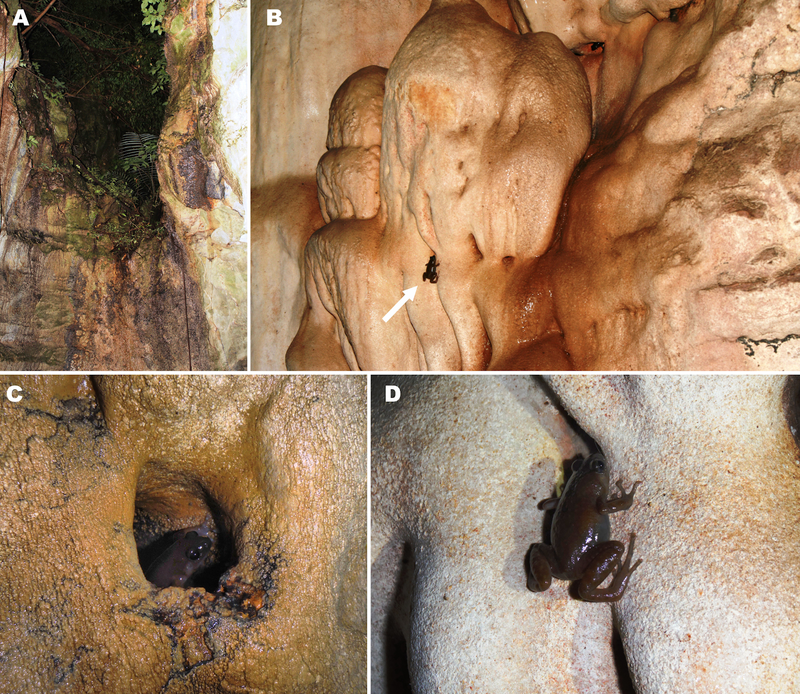 (A) Entrance to the limestone cave where the frogs were recorded; (B) female in situ sitting on the limestone wall of the cave; (C) male in situ sitting in a water-filled crevice; (D) female in situ on the wall of the cave (photos by M. Sumontha); (E, F) tadpole in situ in a water-filled crevice (photos by T. Ruangsuwan). Figure 8: Tadpole of Siamophryne troglodytes Gen. et sp. nov. in life (AUP-00509; Gosner stage 36). (A) In dorsal and (B) in ventral aspects. Scale bar equals to 5 mm. Photos by N. A. Poyarkov. 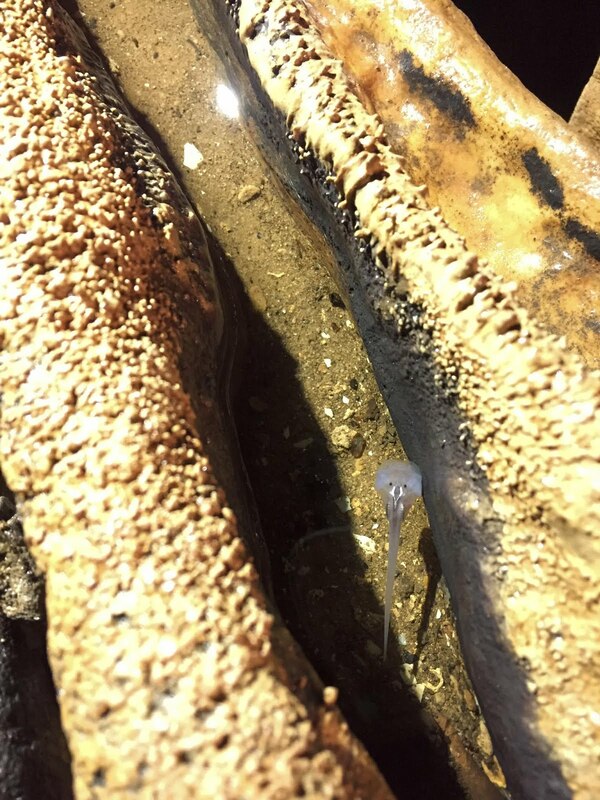 Tadpole of Siamophryne troglodytes Gen. et sp. nov. in preservative (AUP-00509; Gosner stage 36). Figure 9: Tadpole of Siamophryne troglodytes Gen. et sp. nov. in preservative (AUP-00509; Gosner stage 36). (A) In lateral, (B) in dorsal, and (C) in ventral views. Scale bar equals to 5 mm. Photos by T. Ruangsuwan. 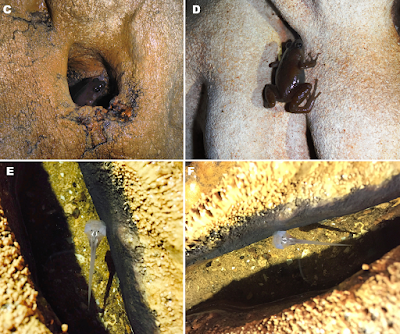 (C) male in situ sitting in a water-filled crevice; (D) female in situ on the wall of the cave (photos by M. Sumontha); (E, F) tadpole in situ in a water-filled crevice (photos by T. Ruangsuwan). Etymology: The specific name “troglodytes” is a Latin adjective in the nominative singular meaning “cave-dweller”, derived from the Greek “τρωγλoδύτης”, with “trogle” meaning “hole, mouse-hole” and “dyein” meaning “go in, dive in”; referring to the troglophilous biology of the new species, which was recorded only in a limestone karst cave system. 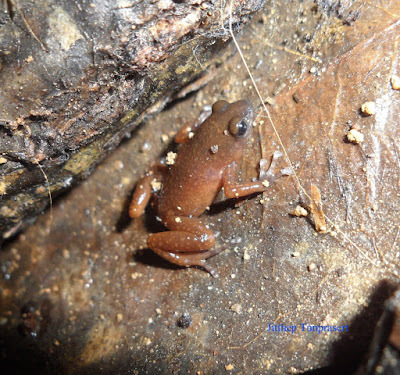 Suggested common names: We recommend the following common names for the new species: “Tenasserim Cave Frog” (English); “อึ่งถ้ำตะนาวศรี - Eung Tham Tenasserim” (Thai). 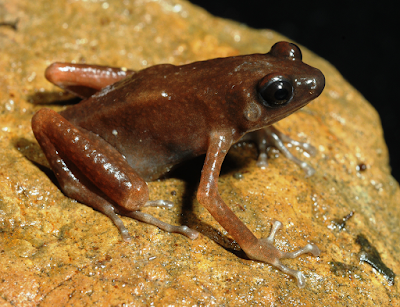 Siamophryne troglodytes Gen. et sp. nov. has a troglophilous life style and to date is only known from a small limestone cave system in western Thailand. 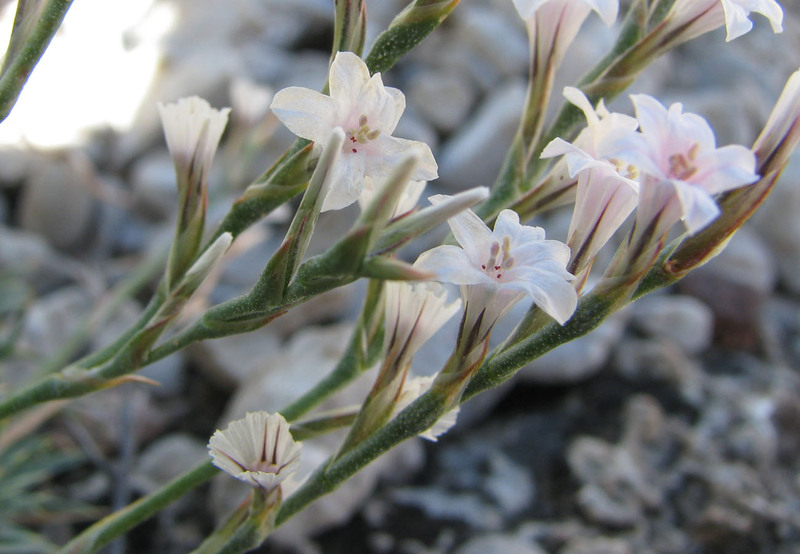 All specimens were collected within a narrow area inside a limestone cave located on elevation 440 m a.s.l. in a polydominant tropical forest in Sai Yok District, Kanchanaburi Province, western Thailand (Fig. 10A). The cave was examined twice on the 1st of August and the 27th of October, 2016. 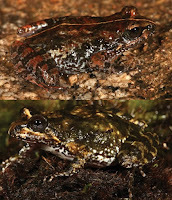 In both cases, adult specimens of S. troglodytes Gen. et sp. nov. were only recorded inside the cave, at a distance of more than 25 m from the entrance, sitting on walls of the cave (Figs. 10B and 10D) or hiding inside small caverns in limestone (Fig. 10C) or under flat stones. Despite the thorough search, no animals were recorded near the cave entrance or in the forest close to the cave. Animals were active from 23:00 to 24:00, when the air temperature inside the cave was 28 °C in August and 26 °C in October, in both cases with 100% humidity. No calling activity was recorded during both surveys. Diet and enemies of the new frog are unknown. 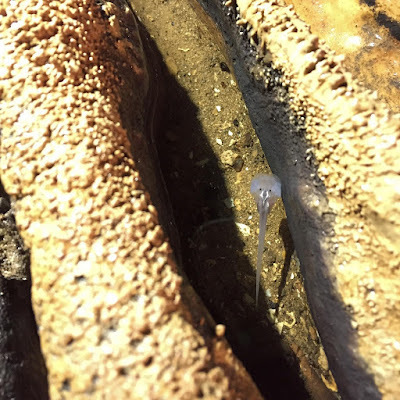 Three tadpoles (one of which was collected) were observed during the survey on the 1st of August, 2016, in a small water-filled cavity in the limestone on the floor of the cave, ca. 10 m from the cave entrance (Figs. 10E and 10F). The cavity was filled with water, the average depth was 4–5 cm; mosquito larvae (Chironomidae) were also observed in the same water body. 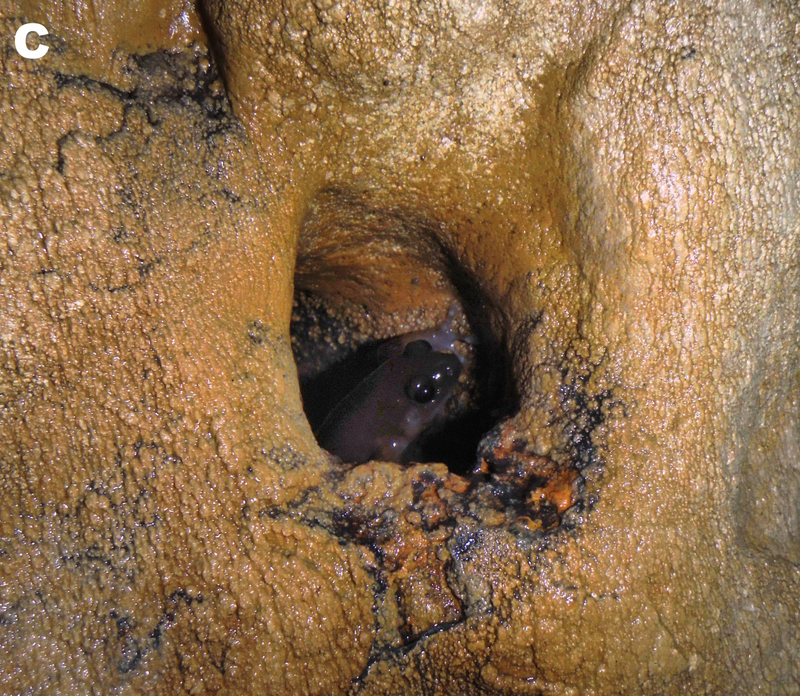 Four other tadpoles (not collected) were discovered in another similar water-filled cavity inside the cave (30 m from the cave entrance). The cave system where S. troglodytes Gen. et sp. nov. was discovered is inhabited by several species of bats which produce significant amount of guano that accumulates on the cave floor. According to a local guide, the locals mine this guano and that affects the ecosystem of the cave. Distribution: As for the genus. At present, S. troglodytes Gen. et sp. nov. is known from a single limestone karst cave in Sai Yok District of Kanchanaburi Province in western Thailand. To date, numerous surveys in the nearby karst massifs have not yielded discoveries of additional populations of the new species. However, further fieldwork in Kanchanaburi Province of Thailand and the adjacent parts of Tanintharyi Division of Myanmar are required. 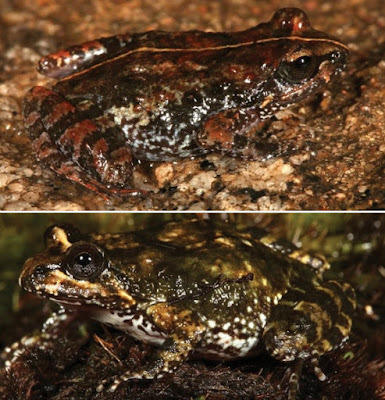 Siamophryne troglodytes, a new genus and species of microhylid frogs from western Thailand, belongs to the subfamily Asterophryinae, which is most diverse in Australasia. Siamophryne and its sister genus Gastrophrynoides are the only two asterophryine lineages found in the areas derived from the Eurasian landmass. Our work demonstrates that S. troglodytes represents an old lineage of the initial radiation of Asterophryinae which took place in the mainland Southeast Asia. 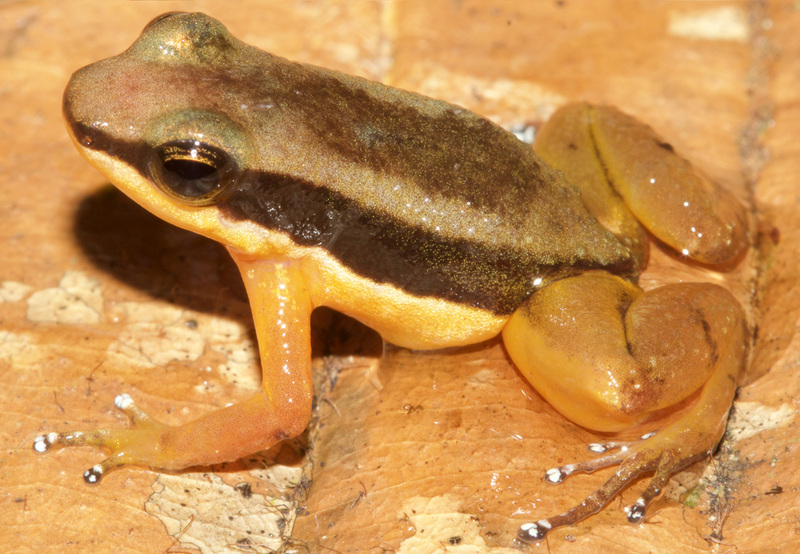 Our results strongly support the “out of Indo-Eurasia” biogeographic scenario for this group of frogs. 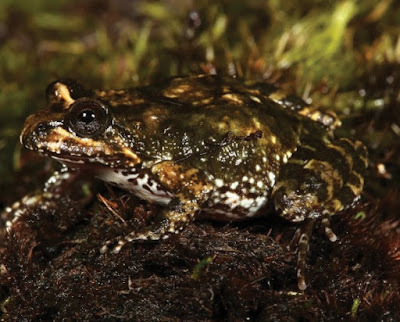 To date, the new frog is the only known asterophryine with a free-living tadpole and troglophilous life style. 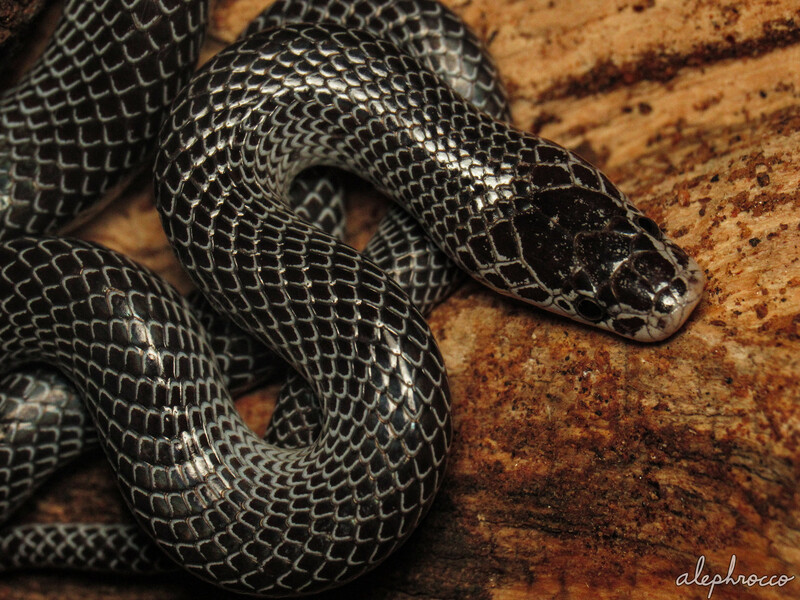 Further studies might reveal new members of Asterophryinae in the mainland Southeast Asia. in Daly-Engel, Baremore, Grubbs, et al., 2018. The sixgill sharks of the genus Hexanchus (Hexanchiformes, Hexanchidae) are large, rarely encountered deep-sea sharks, thought to comprise just two species: the bluntnose sixgill Hexanchus griseus (Bonaterre, 1788) and the bigeye sixgill Hexanchus nakamurai (Teng, 1962). Their distribution is putatively worldwide in tropical and temperate waters, but many verified records for these species are lacking, and misidentification is common. Taxonomic uncertainty has long surrounded H. nakamurai in particular, with debate as to whether individuals from the Atlantic constitute a separate species. Using 1,310 base pairs of two mitochondrial genes, COI and ND2, we confirm that bigeye sixgill sharks from the Atlantic Ocean (Belize, Gulf of Mexico, and Bahamas) diverge from those in the Pacific and Indian Oceans (Japan, La Reunion, and Madagascar) with 7.037% sequence divergence. This difference is similar to the genetic distance between both Atlantic and Indo-Pacific bigeye sixgill sharks and the bluntnose sixgill shark (7.965% and 8.200%, respectively), and between the entire genus Hexanchus and its sister genus Heptranchias (8.308%). Such variation far exceeds previous measures of species-level genetic divergence in elasmobranchs, even among slowly-evolving deep-water taxa. 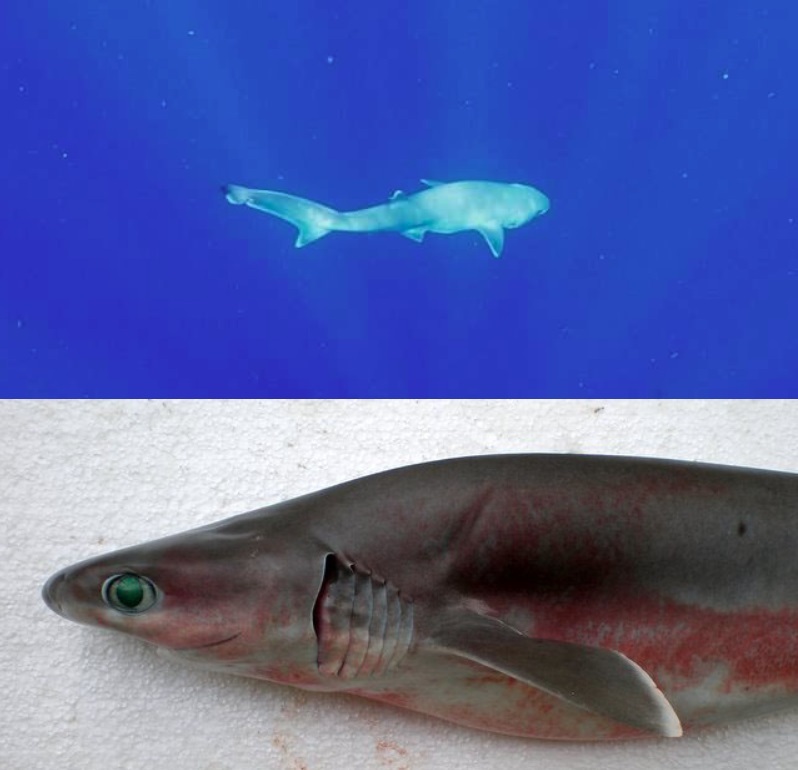 Given the high degree of morphological similarity within Hexanchus, and the fact that cryptic diversity is common even among frequently observed shark species, we conclude that these results support the resurrection of the name Hexanchus vitulus Springer and Waller, 1969 for bigeye sixgill sharks in the northwest Atlantic Ocean. We propose the common name “Atlantic sixgill shark” for H. vitulus, and provide new locality records from Belize, as well as comments on its overall distribution. 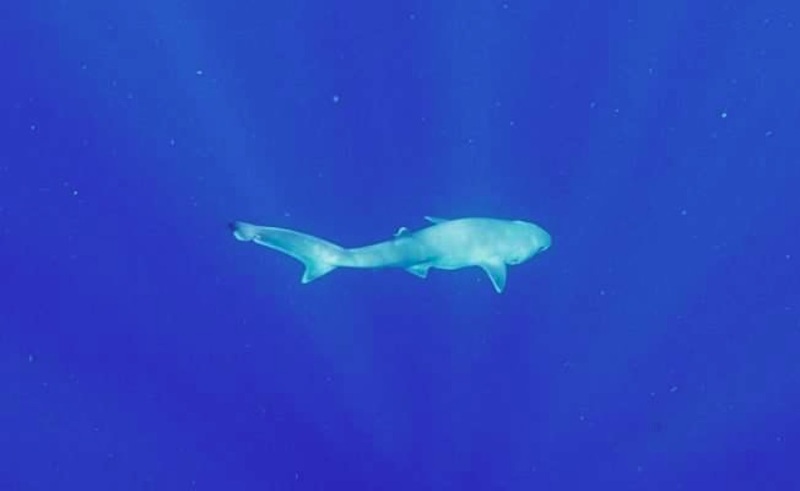 An adult Atlantic sixgill shark swims in the waters off Belize. in Mateussi, Oliveira & Pavanelli, 2018. A revision of the cis-Andean species of Mylossoma is presented. Four species were recognized: M. albiscopum and M. aureum from the rio Amazonas and rio Orinoco basins; M. duriventre, from the rio Paraguai, lower rio Paraná and rio Uruguai basins; and M. unimaculatum, an endemic species from the Tocantins-Araguaia system. 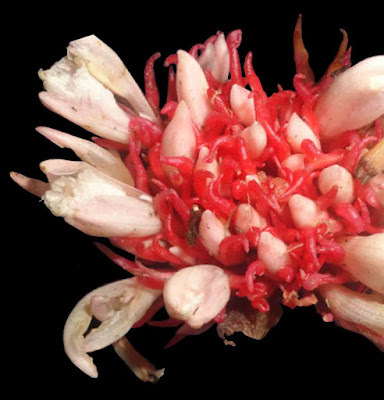 Both Mylossoma albiscopum and M. unimaculatum were removed from the synonymy of Mylossoma duriventre, which had its occurrence range restricted to the La Plata basin. 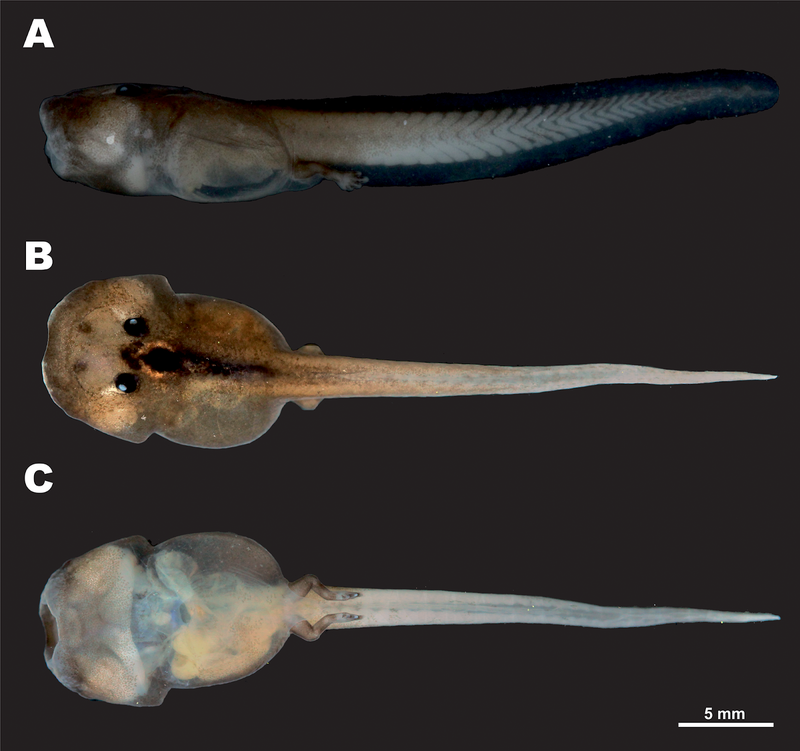 The recognition of these four valid species corroborates the results of a previous DNA barcode study. Redescriptions of each species, and an identification key for the genus are provided. in Jared, Mailho-Fontana, Marques-Porto, et al., 2018. 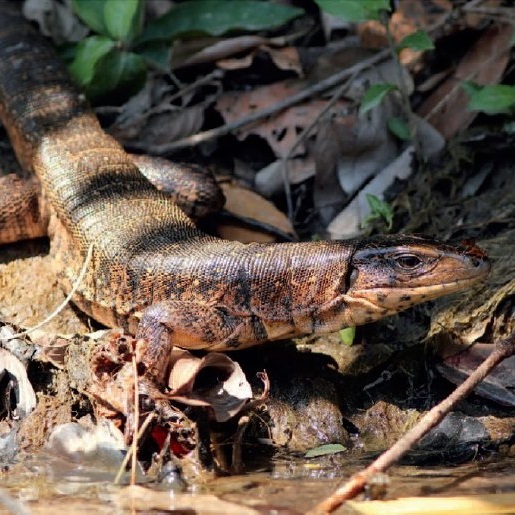 Amphibian skin is rich in mucous glands and poison glands, secreting substances important for gas exchange and playing a fundamental role in chemical defense against predators and microorganisms. 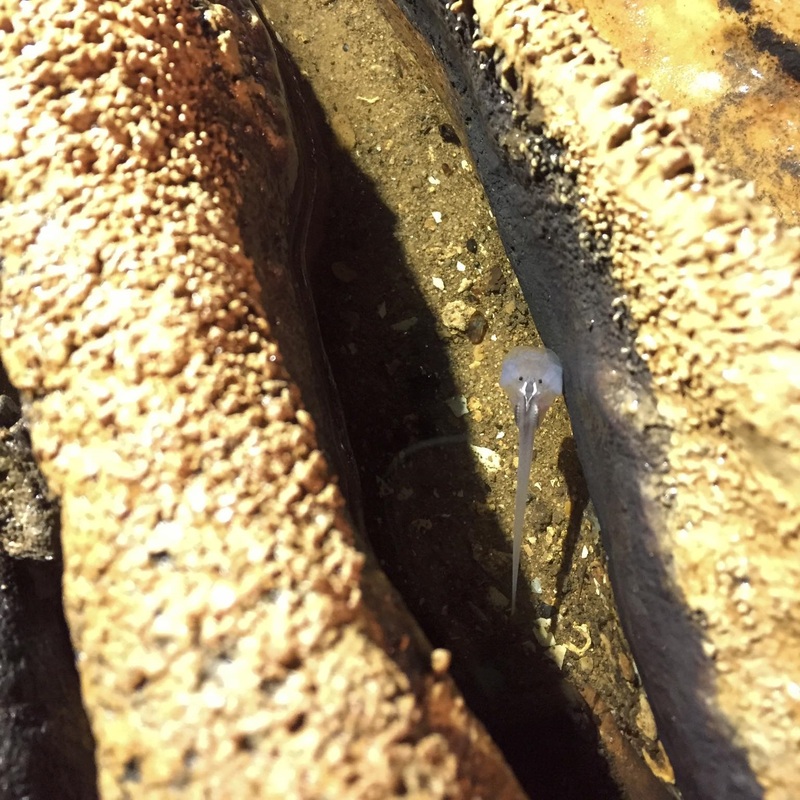 In the caecilian Siphonops annulatus (Mikan, 1920) we observed a concentration of enlarged mucous glands in the head region. In the posterior region of the body a similar concentration is made up of enlarged poison glands. These accumulations of glands structurally resemble the macroglands previously reported in anurans and salamanders. The skin glands in these regions are each surrounded by collagen walls forming a honeycomb-like structure. The collagen network in the head region firmly attaches to tiny pits in the bones of the skull. The two extremities of the body produce different secretions, containing exclusive molecules. 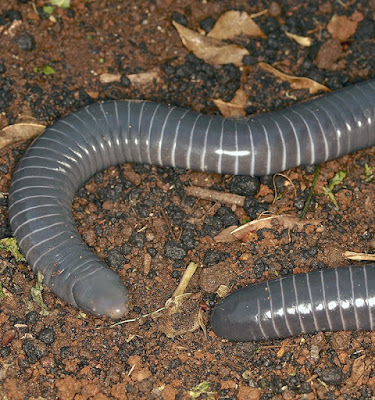 Considering the fossorial lifestyle of caecilians, it seems evident that the secretions of the head and caudal region serve different functions. The anterior macrogland of mucous glands, rich in mucous/lipid secretion, in conjunction with the funnel-shaped head, may act to lubricate the body and penetrate the soil, thus facilitating locomotion underground. The blunt posterior end bearing an internalized macrogland of poison glands in the dermis may act in chemical defense and/or by blocking invasion of tunnels. 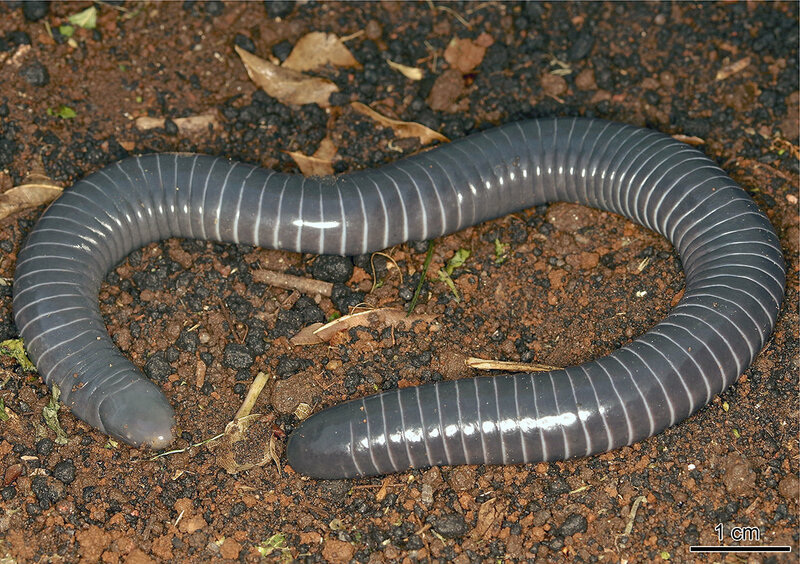 A limbless amphibian, known as Caecilian, Siphonops annulatus, widely distributed in Brazil. Scientists from Utah State University in the United States and Brazil’s Butantan Institute report skin gland concentrations adapted to different evolutionary pressures in the head and posterior regions of the amphibian. 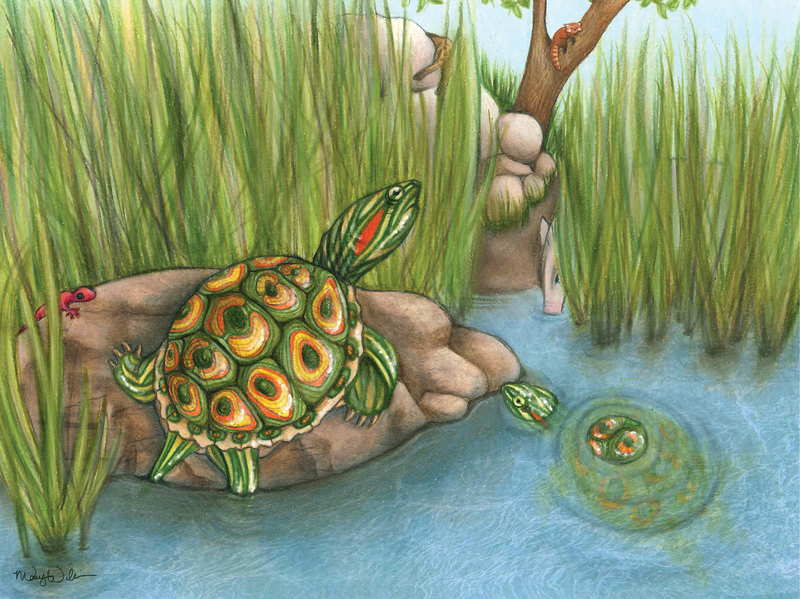 Trachemys (Testudines: Emydidae) represents one of the most well-known turtle genera today. The evolution of Trachemys, while being heavily documented with fossil representatives, is not well understood. Numerous fossils from the late Hemphillian Gray Fossil Site (GFS) in northeastern Tennessee help to elucidate its evolution. 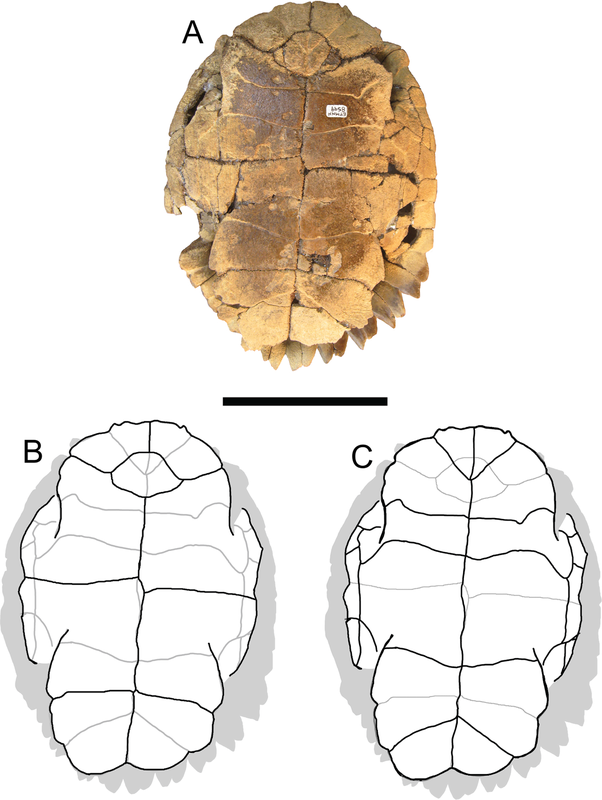 The fossil Trachemys at the GFS represent a new species. The new taxon, Trachemys haugrudi, is described, and currently represents the most thoroughly described fossil emydid species known. A phylogenetic analysis, including 31 species, focusing on the subfamily Deirochelyinae is performed that includes the new fossil species, along with numerous other modern and fossil deirochelyine species, representing the first phylogenetic analysis published that includes several fossil deirochelyines. 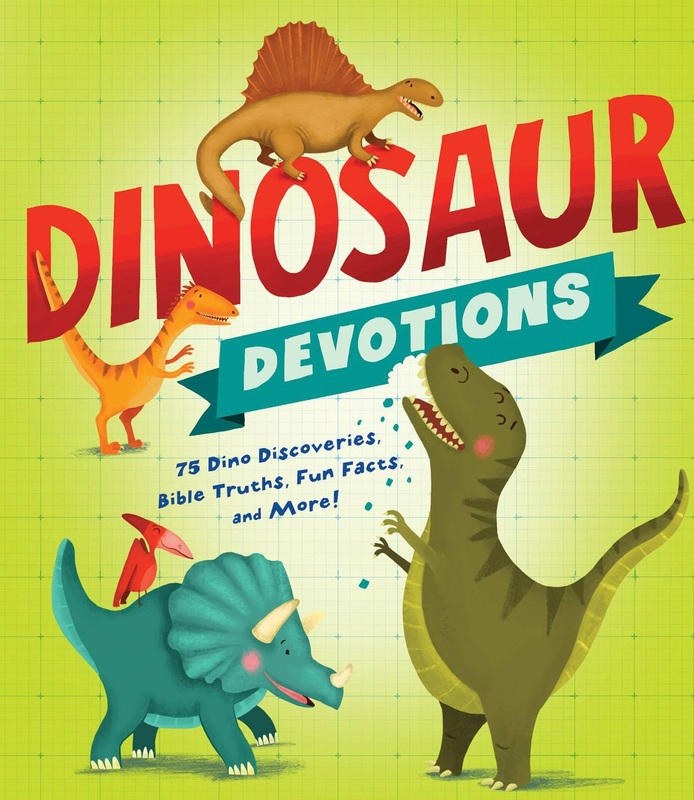 The phylogenetic analysis, utilizing morphological evidence, provides monophyletic clades of all modern deirochelyines, including Chrysemys, Deirochelys, Pseudemys, Malaclemys, Graptemys, and Trachemys. A strict consensus tree finds the recently described fossil species Graptemys kerneri to be part of a clade of Graptemys + Malaclemys. 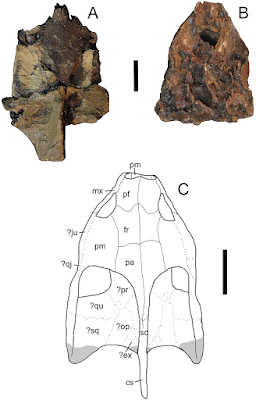 Three fossil taxa, including one previously referred to Pseudemys (Pseudemys caelata) and two to Deirochelys (Deirochelys carri and Deirochelys floridana) are found to form a clade with modern Deirochelys reticularia reticularia, with D. floridana sister to the other members of the clade. Chrysemys is found to be part of a basal polytomy with Deirochelys in relation to other deirochelyine taxa. Two fossil taxa previously referred to Chrysemys (Chrysemys timida and Chrysemys williamsi) form a paraphyly with the modern Chrysemys picta picta and Deirochelys, and may be referable to distinct genera. Additionally, fossil taxa previously attributed to Trachemys (Trachemys hillii, Trachemys idahoensis, Trachemys inflata, and Trachemys platymarginata) and T. haugrudi are found to form a clade separate from clades of northern and southern Trachemys species, potentially suggesting a distinct lineage of Trachemys with no modern survivors. 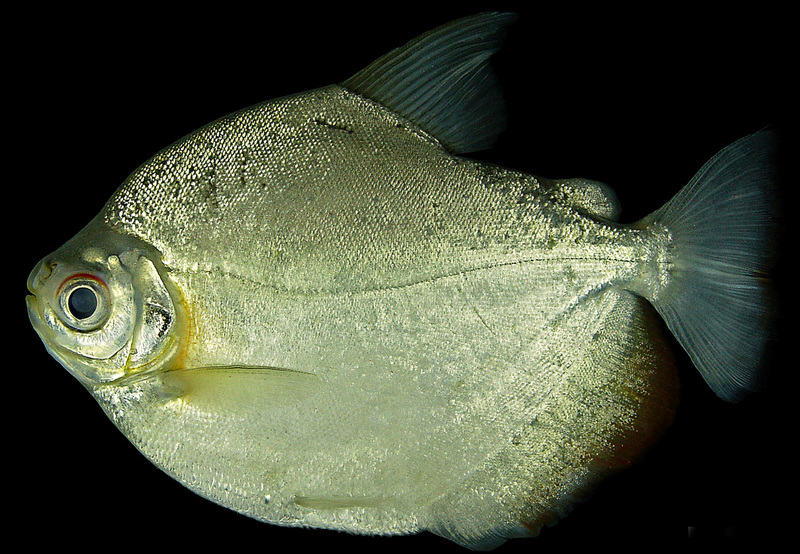 Hypotheses of phylogenetic relationships mostly agree between the present study and previous ones, although the inclusion of fossil taxa provides further clues to the evolution of parts of the Deirochelyinae. The inclusion of more fossil taxa and characters may help resolve the placement of some taxa, and further elucidate the evolution of these New World turtles. Figure 7: Trachemys haugrudi, paratype skull (ETMNH–3562) in dorsal view. (A) Dorsal portion in dorsal view; (B) ventral portion in dorsal view; (C) reconstruction of skull in dorsal view. Area shaded gray is not preserved and has been reconstructed. Dotted lines represent sutures that were not clear in the specimen. Skull has been reconstructed in the slightly deformed state the specimen is in in real life. cs, crista supraoccipitalis; den, dentary; ?ex, ?exoccipital; fr, frontal; ?ju, ?jugal; mx, maxilla; ?op, ?opisthotic; pa, parietal; pf, prefrontal; pm, premaxilla; po, postorbital; ?pr, prootic; ?qj, ?quadratojugal; ?qu, ?quadrate; so, supraoccipital; ?sq, ?squamosal. Scale bars are 1 cm. Figure 3: Trachemys haugrudi, holotype shell (ETMNH–8549). 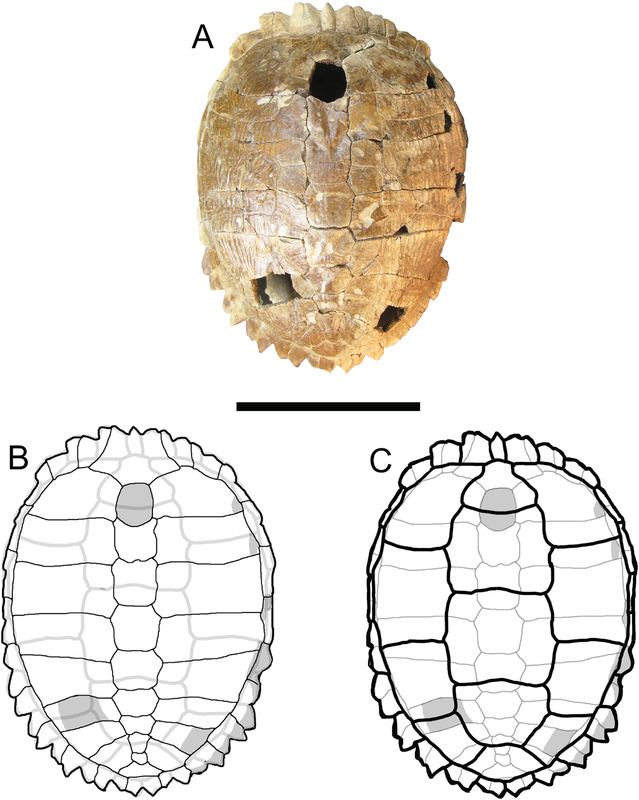 (A) Dorsal view of carapace; (B) line drawing of carapace in dorsal view, with bones outlined in black and scutes outlined in gray; and (C) with scutes outlined in black and bones outlined in gray. Missing portions are shaded in gray. Scale bar is 10 cm. 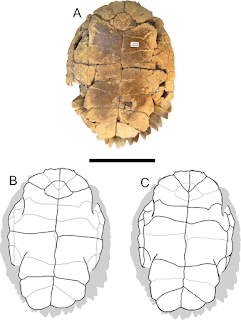 Figure 4: Trachemys haugrudi, holotype shell (ETMNH–8549). (A) Ventral view of plastron; (B) line drawing of plastron in dorsal view, with bones outlined in black and scutes outlined in gray; and (C) with scutes outlined in black and bones outlined in gray. Scale bar is 10 cm. Type horizon and age: Late Miocene–early Pliocene (late Hemphillian LMA, 7.0–4.5 Ma). This range means the fossil locality, and T. haugrudi, lies somewhere within Hh3–Hh4 (see Tedford et al., 2004 for discussion of substages). Etymology: The specific name honors Shawn Haugrud, preparator at the GFS who spent countless hours working on many of the specimens cited within and who helped piece this ancient turtle back together. Figure 13: Life reconstruction of Trachemys haugrudi during the late Hemphillian at the Gray Fossil Site in eastern Tennessee. Several taxa that would have lived alongside T. haugrudi are also shown, including Caudata indeterminate, Tapirus polkensis, cf. Machairodus sp., and Pristinailurus bristoli (Wallace & Wang, 2004; Boardman & Schubert, 2011b; Schubert, 2011; Jasinski, 2013a). Artwork by Mary P. Williams, with permission. We describe a new species of nurse-frog (Aromobatidae, Allobates) from northwestern Brazilian Amazon. Allobates juami sp. 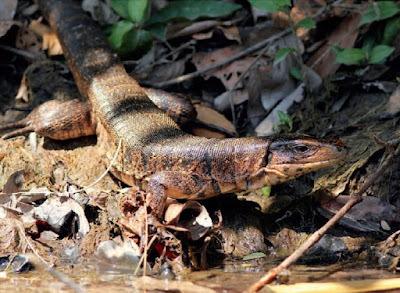 nov. is distinguished from similar congeneric species by the combination of the following characters: body-size range (snout-to-vent length 17.5–18.5 mm), lack of dark pigments on ventral surfaces of male specimens, dorsal color pattern (predominantly solid dark brown, but conspicuously light brown over snout and urostyle regions), presence of conspicuous pale dorsolateral and ventrolateral stripes, and presence of a diffuse pale paracloacal mark. 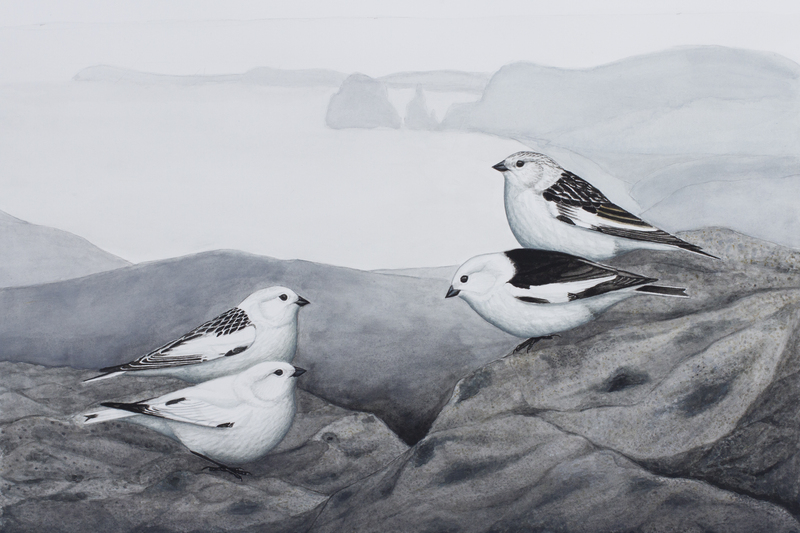 The advertisement call of the new species lasts 2.5–5.1 s, contains 60–73 short notes (trills), and is emitted at an average rate of 13 notes per second within trills. Duration of silent intervals between notes ranges between 0.020–0.050 s, and the peak frequency of notes ranges from 4.59 to 5.47 kHz. The new species is currently known only from the type locality at Estação Ecológica Juami-Japurá (~ 87 m a.s.l.). Tupinambis matipu on the River Cristalino bank. Etymology.— The specific epithet, matipu, is a noun in apposition and refers to the indigenous people Matipu, whose village lies at about 125 km west of the type locality, on the southern portion of Parque Indı´gena do Xingu, Mato Grosso state, Brazil. By 2011, they numbered only 149 persons according to the Instituto de Pesquisa Etno-Ambiental do Xingu/Ipeax (Ricardo and Ricardo, 2011). Resumo: Descrevemos uma nova espécie de Tupinambis da região central da América do Sul, em uma área de transição entre Amazônia, Cerrado e Pantanal. A nova espécie difere das congêneres pelo número de poros femorais, escamas gulares posteriores, escamas entre as dobras antegular e gular, e padrão de coloração. É simpátrica com Tupinambis cuzcoensis, T. longilineus, T. quadrilineatus e tavez também com Tupinambis teguixin, mas em termos gerais essas espécies tendem a se substituir geograficamente. 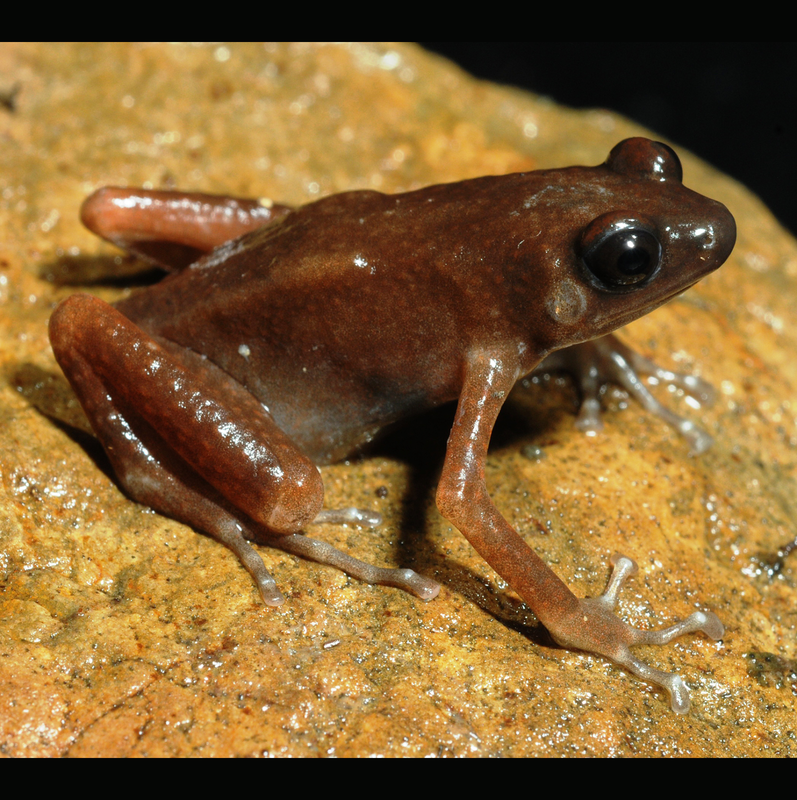 Nothophryne Poynton, 1963 is a monotypic genus of frog, with the nominal species N. broadleyi found only on Mount Mulanje, in southern Malawi. 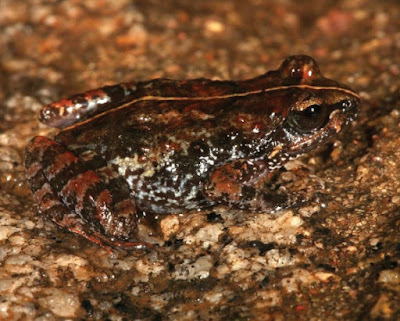 Recent surveys in northern Mozambique, however, have uncovered at least four new species associated with four inselbergs (Mount Inago, Mount Namuli, Mount Ribáuè and Taratibu Hills). 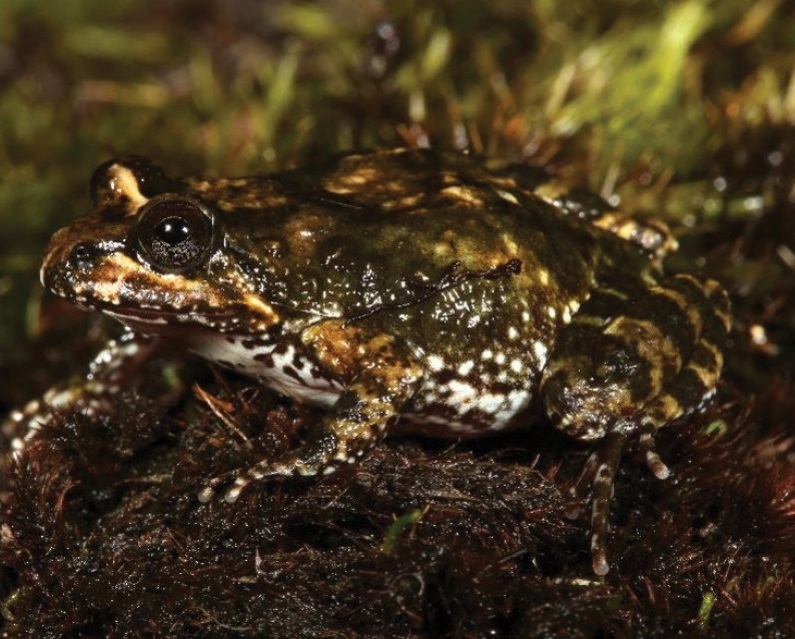 Previous phylogenetic analyses using mitochondrial genes suggest that each mountain isolate has an endemic species of Nothophryne. Herein we provide a rediagnosis of the genus and comparative diagnoses of four new species based on new material. 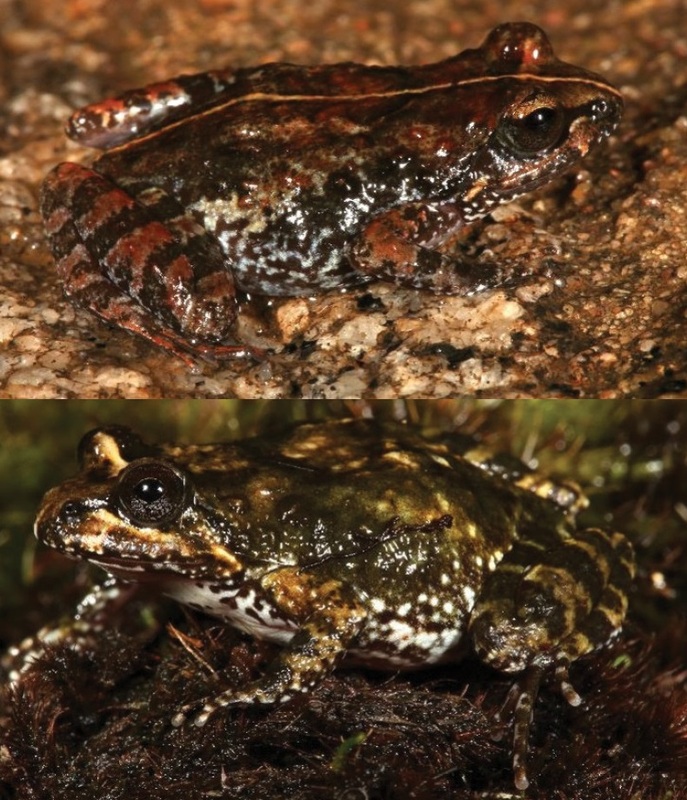 Etymology—We name this species in honour of Dr Julian Bayliss who was the first to document this unique species of frog from the slopes of Mount Namuli, during the Kew Gardens-Darwin Initiative expedition to these inselbergs (Timberlake et al. 2009). 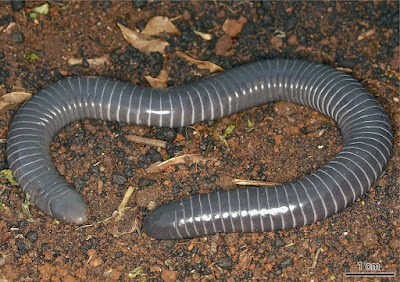 Distribution— Currently only known from Mount Namuli in central Mozambique. 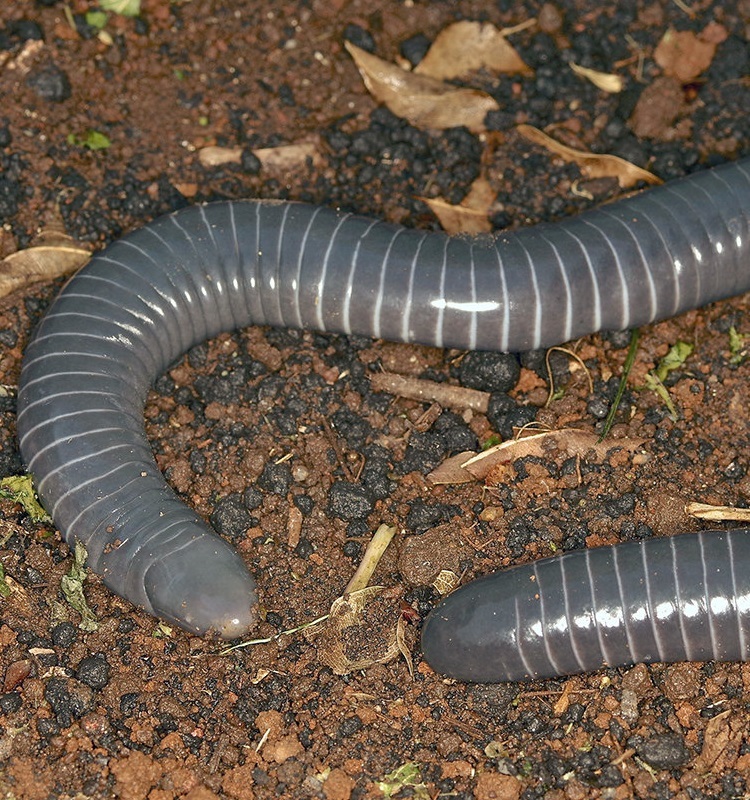 Etymology—The new species is named after Mount Inago, where this species is endemic. 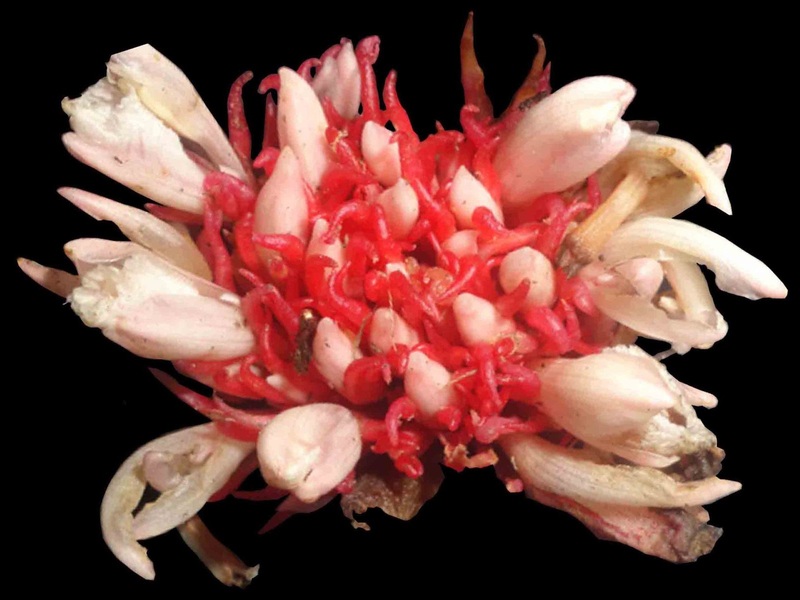 Distribution—Currently only known from Mount Inago in central Mozambique. Adult Nothophryne ribauensis sp. nov. from Mount Ribáuè. Etymology—The new species is named after Mount Ribáuè, from which it is currently only known from both Mount Ribáuè and Mount M’pàluwé section of the massif. Distribution—Currently only known from Mount Ribáuè in central Mozambique. Distribution— Currently only known from low lying inselbergs in north eastern Cabo Delgado Province of Mozambique. The type locality is situated ..., in the Quirimbas National Park. 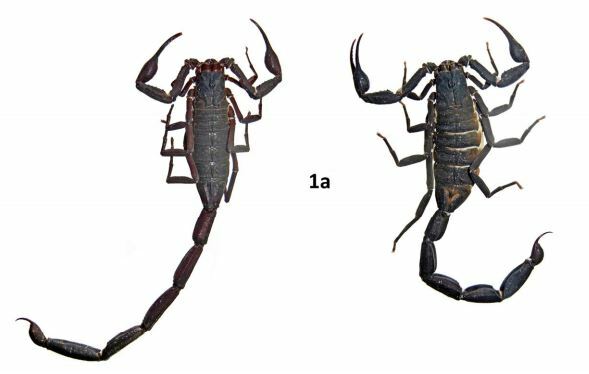 A new species, Acantholimon ibrahimii Akaydın, is described, illustrated and discussed in comparison with its close relative A. davisii. 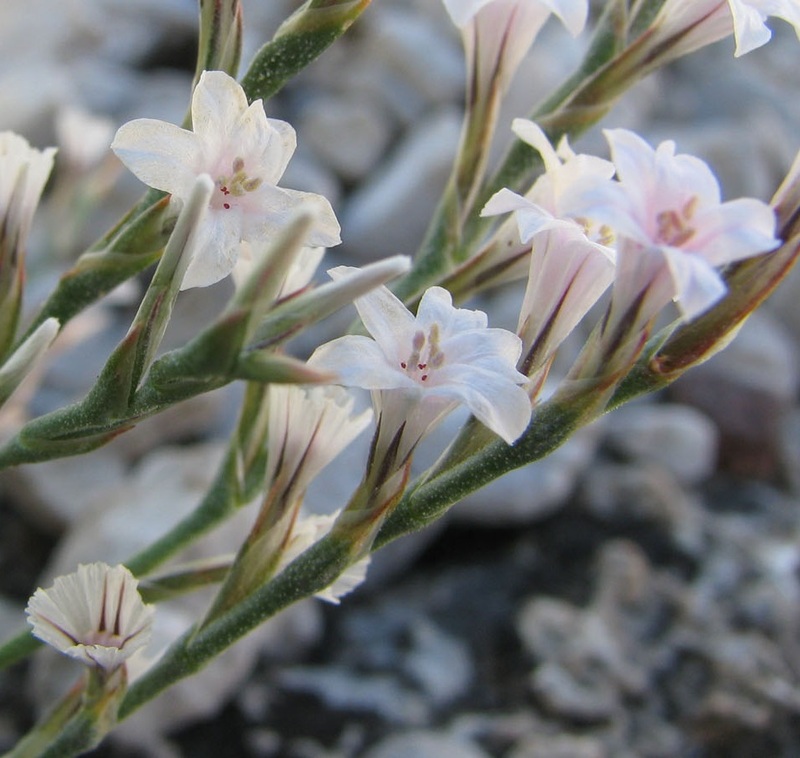 The new species is distinguished from the latter species mainly by the generative organs (namely the inflorescence types and petals colour), habitat type and ecological behaviour. Data are also reported on the conservation status of A. ibrahimii, which is suggested to be labelled as EN according to the IUCN categories. Furthermore, a revised key to the Turkish Acantholimon species of A. sect. Staticopsis with spike laxly distichous and scape much longer than leaves is presented.